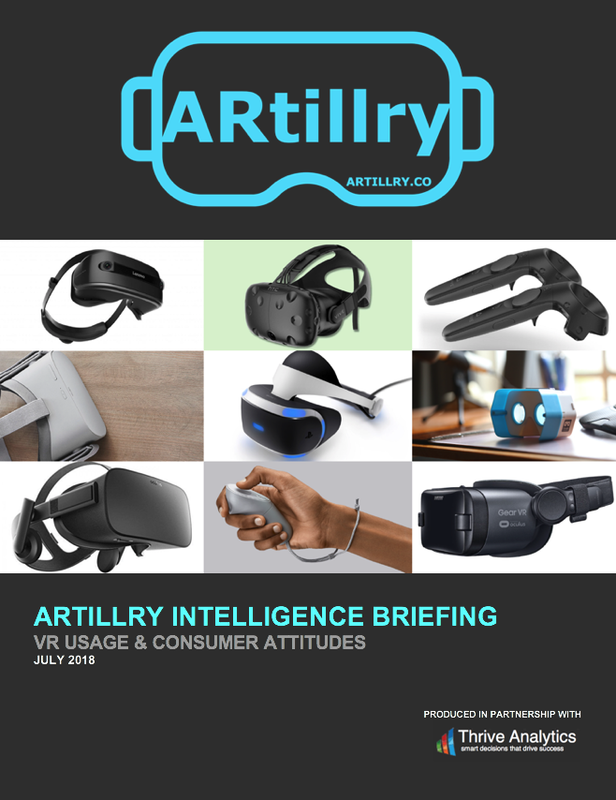 This post is adapted from ARtillry’s latest Intelligence Briefing, VR Usage & Consumer Attitudes. It includes some of its data and takeaways, including original market sizing and forecasting. Subscribe to ARtillry Insights for the full report. How do consumers feel about VR? Who’s using it? What devices and apps do they prefer? And what do they want to see next? Perhaps more important, what are non-users’ reasons for disinterest? And how can VR software developers and hardware players optimize product strategies accordingly? These are key questions at VR’s early stages that we set out to answer. Working closely with Thrive Analytics, ARtillry Intelligence wrote questions to be presented to more than 1,900 U.S. adults in Thrive’s consumer survey engine. And we’ve analyzed the results in a narrative report. This follows last year's first installment of the report. Wave II of the research now emboldens our understanding and brings new insights and trend data to light. There are also notable parallels in these results to our sister report on AR adoption published in April. So what did we find out? At a high level, eleven percent of consumers surveyed have bought or used a VR headset, up from eight percent in 2017. More importantly, VR users indicate high levels of satisfaction: 65 percent of respondents report moderate or extreme satisfaction. However, it’s not all good news: Non-VR users report relatively low likelihood of VR adoption – 31 percent, down from 41 percent in 2017 – and explicit lack of interest. This downward trend is concerning for VR but isn’t surprising given the dip in excitement we’ve anecdotally observed. Moreover, the disparity between current-user satisfaction and non-user disinterest underscores a key challenge for VR: you have to “see it to believe it.” In order to reach high satisfaction levels, VR has to first be tried. This presents marketing and logistical challenges to push that first taste. Put another way, VR’s highly visual and immersive format is a double-edged sword. It can create strong affinities and high engagement levels. But the visceral nature of its experience can’t be communicated to prospective users with traditional marketing such as ad copy or even video. The same challenge was evident in our corresponding AR report, but mobile AR’s barriers to adoption are lower. This is nonetheless a common challenge for immersive technologies. It will take time, acclimation and price reductions before they reach more meaningful penetration. Meanwhile, there are strategies to accelerate that process, and to market VR more effectively. We examine those strategies in the latest ARtillry Intelligence Briefing, through the lens of consumers’ explicit sentiments, actions and desires. There's a lot to unpack, as we'll do in the coming weeks.